I confess, I'm a Christmas Addict. I have an assortment of beautiful ornaments going back over 40 years. My tree groans and creaks from the sheer weight, and we have been known to use a steel cable to tehter it to the wall to keep it upright! Its a wonderful mix of colors, shapes and styles. And I wouldn't part with any of it for the world. However, I do find myself drawn to photos of those gorgeous theme trees. You know, where everything is a very simple color pallette and everything coordinates? That's what inspired this little filled table. Its a dark wood vintage Bespaq table topped with a white doily. Everything on the table is in white and silver with LOTS of sparkle and shine. There are two wonderful Bellsnickle (folk santa). I have the exact same pair in full size and mine are finished just like these... one in silver glass glitter and the second in grey flocking. Both have silver tinsel trim. There's a shiny bowl filled with our new resin cast ornaments, this time finished in silver and crystal glitters. 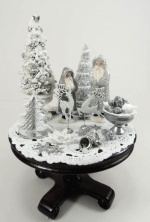 In a sparkling urn, there is a wonderful "flocked" and glittered tree with loads of beautiful silver ornaments. A laser cut lacy tree sits on a mirrored base, and a whimsical tinsel tree stands behind the Bellsnickles. There are lots of little filler items, snowflakes, poinsettas, bells, etc. 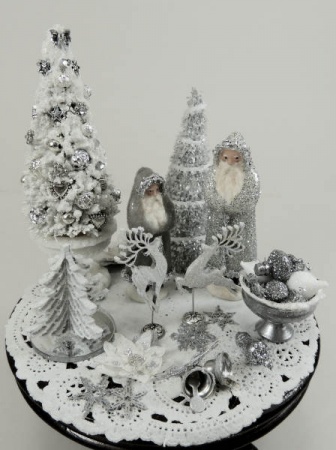 Kit includes table, all decorations, silver and crystal glitters and snow for the tree. You will need basic tools, such as scissors, tweezers, etc, glues and paints. I purchase all of the tables that were available, and unfortunately, there are only 22 spaces available for this class. This is about 1/3 of the number I usually have for any online class, so I am sure that this class will sell out quickly. If you are interested, don't delay. This one won't last long!